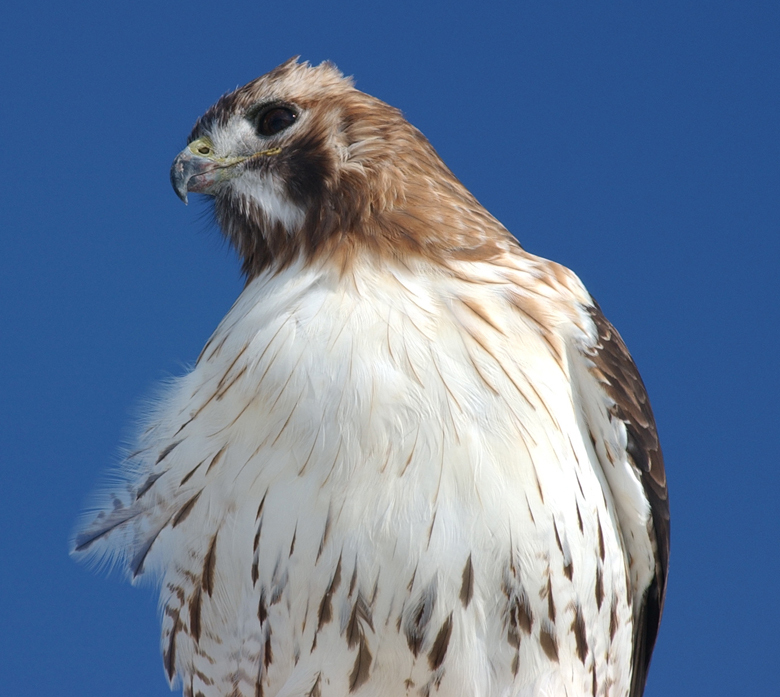 For links to events, click here. The EPP2010 report made headlines a couple of weeks ago. What does it say about the future of Fermilab? Find out more today at 1:30 in the Ramsey Auditorium, where EPP2010 Committee member Chuck Shank and Committee co-chair Sally Dawson will speak to the Fermilab community. Everyone at Fermilab is invited to attend. In the top left corner of theoretical physicist Marcela Carena's chalkboard, next to a paper flower from her 10-year-old son, lies a graph of cosmic significance. The graph shows the range at which the Tevatron should be able to detect "stops," the supersymmetric partners to top quarks, whose detection could radically alter the way we think about the universe. Supersymmetry fills many of the holes in our understanding of the universe and demands that every particle we know have a mirror particle. "We're looking for stops at the Tevatron, but they are difficult to find. A proton is [made of] a lot of things," Carena says. She scratches two sets of three lines, representing the three quarks that make up a proton, and has them converge in a messy "V," representing the collision between two protons. But since electrons are themselves fundamental particles--Carena accents this with a clean two-lined "V" representing the collision between an electron and an anti-electron, or positron--the ILC will be a "cleaner" environment than the Tevatron's proton-antiproton collider, making it easier to spot stops and other supersymmetric particles. Supersymmetry provides a possible candidate for dark matter, the stuff that makes galaxies rotate faster than they should. In the top center of Carena's board, a diagram shows how an electron-positron collision could produce a pair of stops (t), which would in turn decay into neutralinos (x)--the lightest neutral supersymmetric particles, whose weak interactions with normal matter make them strong candidates for dark matter. By making precise measurements of the masses and interactions of SUSY particles at collider experiments, physicists can infer the properties of dark matter particles and compute the amount of dark matter in the universe. If their measurements match those of astrophysicists, "then you know what you're seeing is dark matter," Carena said. Two University faculty members, Francisco Bezanilla, Professor and Pritzker Scholar in Pediatrics and the Institute for Molecular Pediatric Science, and Melvyn Shochet, the Elaine M. & Samuel D. Kersten Jr. Distinguished Service Professor in Physics, the Enrico Fermi Institute and the College, were among 72 individuals elected to the National Academy of Sciences on Tuesday, April 25. Election to the 143-year-old academy is considered one of the highest honors that can be awarded to an American scientist. The election of Bezanilla and Shochet brings to 41 the current number of Chicago faculty elected to membership. 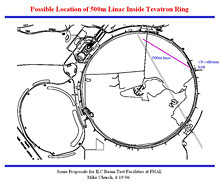 One possible location for placing a linac inside the Tevatron ring as a test facility for the ILC. Before the International Linear Collider can be built, physicists and engineers must prove that the proposed baseline design will achieve the desired physics, requiring testing and R&D at laboratories and institutions around the world. 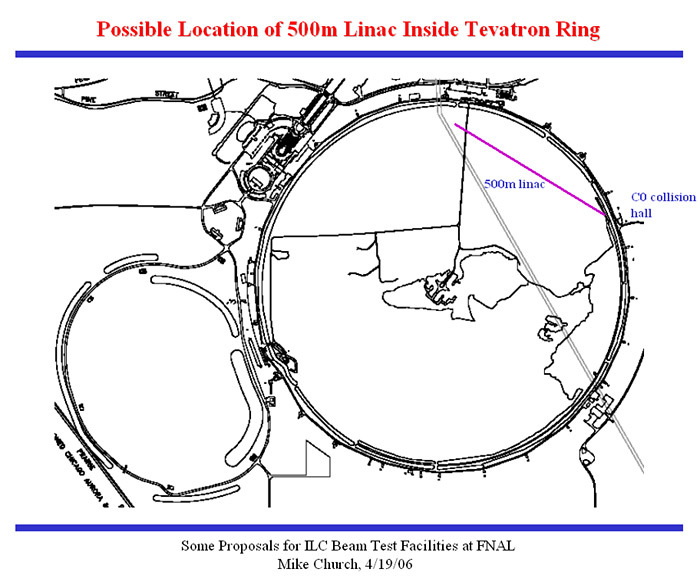 As part of this process, Fermilab's Mike Church recently shared with attendees, at a weekly ILC R&D meeting, one possible proposal for ILC Test Beam Facilities that would utilize the lab's already existing infrastructure. In an early stage of development and not yet endorsed by Fermilab management, the proposal will continue to be evaluated and reviewed not only by the lab but also by the Global Design Effort and the Department of Energy. "This is a work in progress," Church said. "We haven't thought too seriously about cost, location or a timeline yet. The tiered proposal allows you to make more rational decisions about what you're getting." This year's event is from 11:30 a.m. to 1:30 p.m. on Ring Road. Participants may sign in, pick up a game ticket and grab a bottle of water at A1, then walk, run, rollerblade, or bike around the ring. A section of Main Ring Road in front of the A0 storage building is closed until 5:00 p.m. today. The emergency closure is necessary to replace an oil switch. People using the A0 lot should allow time for a 4-mile detour. Detour signs will be posted. On Saturday, May 20, there will be a major power outage in Wilson Hall from 7:00 a.m. to 5:00 p.m. Please plan accordingly. There will be a Fermilab Folk Club Barn Dance Sunday, May 14 at 6:30 p.m. with music by Dr. Hojka's Medicine Show and calling by Lisa Ornstein. More information is available on the website. Due to forecasted weather conditions on Saturday, May 13, this week's launch will be re-scheduled for Saturday, May 20th from 10am to 3pm. The recreational summer volleyball league will start on May 22. Interested teams and individual players should contact league representative Jenny Thorson, jthorson@fnal.gov or call x3470. Team rosters need to be submitted to Jenny by Monday, May 15. For more information check the volleyball web page. The Fermi Singers are going to have a concert on June 2, more information will be posted soon.